If you’ve seen a Monarch butterfly recently, (or any butterfly, for that matter) consider yourself lucky. As gardeners, wildlife-watchers and insect-lovers can all attest, there has been a considerable shortage of the graceful creatures in our area so far this summer. The common yellow sulfurs aren’t so common, and the cosmopolitan painted ladies aren’t very cosmopolitan this year. Perhaps most conspicuously absent is the striking, orange-and-black, Monarch butterfly. The Monarch is well-known to many of us, not just for its vibrant and unique colors, but also for the amazing story of its life cycle. Most Monarch Butterflies live out their entire life in our neck of the woods during the course of the summer. They start out as a tiny egg laid on the underside of milkweed leaves, then metamorphose through the larva (caterpillar) and pupa (chrysalis) stages until emerging as an adult butterfly. But, Monarchs that emerge in the fall of the year must migrate 1000 to 2000 miles to central Mexico to spend the winter. All of the Monarch Butterflies from across North America spend their winters huddled together in just a handful of specific sites, each no larger than a few acres, where oyamel fir trees grow. These oyamel firs form a dense canopy high in the mountains, that keeps rain and snow at bay and keeps the atmosphere cool and moist allowing the butterflies to expend as little energy as possible. Which brings us to WHY there are so few Monarchs this year. One reason is that these oyamel fir forests suffered in the past from illegal logging which made wintering Monarchs more vulnerable to bad weather. But that is only part of the story. Another huge part of the problem is the loss of habitat they have suffered here. The upper Midwest has traditionally been the most important summer breeding area for Monarchs because of the abundant milkweed. But, since the advent of RoundUp-ready and similar crops, spraying has supplanted tillage, and milkweed in fields and road ditches have become much less common. The habitat issues in the Midwest and in Mexico account for most of the long-term trend in Monarch declines, but last year’s weather plays a prominent role in this year’s extremely low numbers. 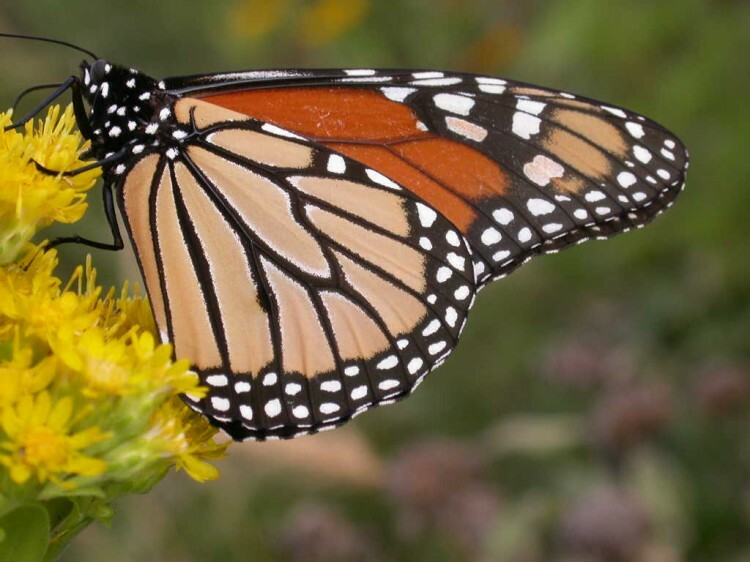 Monarchs were abundant in the spring of 2012. Then the torrential rains came and killed many. Then the rains stopped entirely and we had one of the worst droughts in this area in recorded history. This combination of a very wet spring followed by a very dry summer and fall was devastating to nearly all of our local butterfly species, including the loss of over half of the world’s Monarchs. A study of the Monarch wintering grounds this past winter found that Monarch numbers were so low that every Monarch on the planet now overwinters in an area of oyamel fir forest no larger than 2 or 3 football fields. In most cases, these annual population fluctuations are normal and the butterflies will rebound. In the case of the Monarch, however, the combination of weather impacts and habitat loss could prove to be the beginning of the end if we don’t take steps to help them. What can you do? Spray selectively, and leave milkweed in roadside ditches, plant a milkweed garden in your back yard and, most importantly, teach others about their need for help.